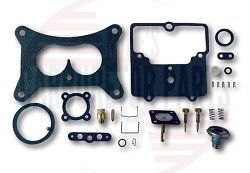 We have four different kits for the 2100 carburetor. This kit fits all except 1957's, AMC & Jeep. The remaining two kits are specific to American Motors & Jeep. Includes an extension shaft for the diaphragm. 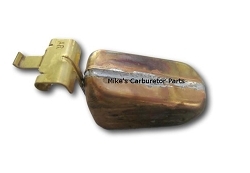 Some carburetors use the simple flat shaft, while others need the extended shaft. Both are covered. 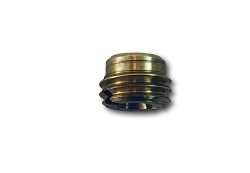 Some 2 barrels use a rubber vent valve on top of the carburetor. 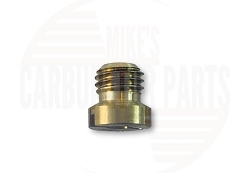 If you have this type, then consider adding the Vent Valve to your order. Please be sure to match your carburetor number with the list provided. While the application list is a guide it does not insure the correct carburetor kit. 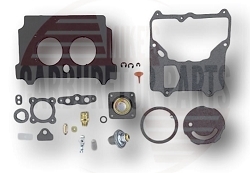 Motorcraft 2100 rebuild kit, made in the USA from high quality ethanol ready parts. 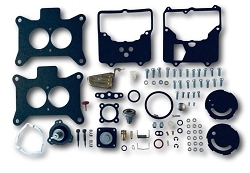 Everything shown in the photo is included in the kit, additional parts may be purchased by choosing your carburetor type in our main catalog. For additional help including rebuild videos, free manuals, and troubleshooting, please see our technical section. 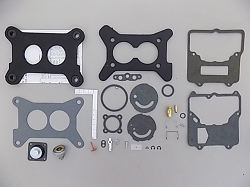 The kit came with high-quality gaskets and good instructions with regards to the rebuild as well as adjusting the carb once complete. This was my first carburetor rebuild ever, so I was quite nervous, but it went just fine and the truck is running great. If you did not get here from the You-tube videos, watch Mike's 3 or so videos on the Motorcraft 2100. They will be very helpful in your rebuild. Highly recommend! From the website, to the product, to the customer service, this experience was 5-Star. The kit itself was very well organized and well packaged. Instructions came with the kit, but expanded manuals were available as downloads from the web. I highly recommend this product and this vendor for those of us who still operate carbureted vehicles. All the parts in the kit are high quality and fit perfectly. My old pick up truck is much happier with the rebuild. I'd forgotten how well it could run. Shipping ws beyond exceptional. Item arrived within 3days of ordering. The prices are extremely affordble and competitive. Will be doong business again. Love it! Got my parts in record time as usual, good fit, quality. Good shipping options and prices; no handling fee gouging either. Why I come here first if I need carburetor parts. Great kit. Provided everything I needed for my 1st carb rebuild. Easy directions. Great online video helped as well. Super fast shipping and great communication. All of the parts were there and were of good quality, carburetor worked great after the rebuild. Parts fit well shipping was good the whole experience was very good I would order from there again. There is an instruction sheet, but it isn't a step by step manual. Q: Will this fit motorcraft carb d2gf ac? 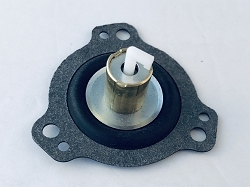 Q: Does this carburator kit fit this number D3TF DE? Q: My carb is missing the tag the base says 4TJA. Is this the correct kit? I notice most kits don't have the Choke Pull off. IS that sold separate or part of the Kit? From What I have researched this carb was from 1974 Ford Pickup but I can't tell if it is a 2100 or 2150. It has a straight Base and is not curved but only has a single stage power valve. It is also missing the Choke assembly. do you sell that and the hardware for it? Q: Is their a Holley equivalent to the Motorcraft 2100? Q: I have a 1961 Ford Fairlane with the 292 y block. From all the videos I've seen and compared to what carburetor I see on my car, it looks to be the Autolite 2100. Do you know if this is accurate? I see in the description it says from 1964 and up Ford. How to install the float retainer. Be careful adjusting the float level. 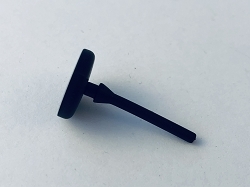 Any pressure put on the needle can damage the viton tip and cause it to leak.